This circuit provides an analogue signal which gives a representation of the levels of light that are falling on the phototransistor on the board. 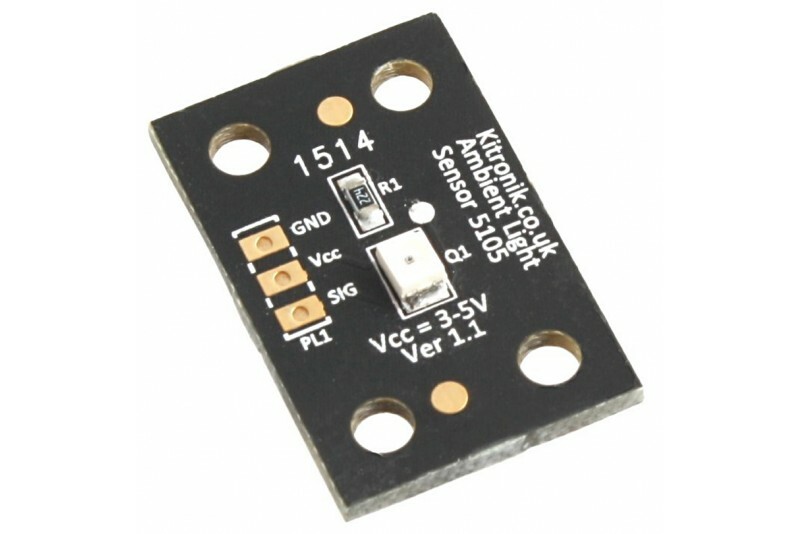 This circuit uses an SFH 320-3/4-Z phototransistor and provides an analogue signal which gives a representation of the levels of light that are falling on the phototransistor on the board. This is achieved by creating a potential divider using a 2M2 resistor and the phototransistor. As the light level increases the resistance of the phototransistor decreases, which increases the voltage at the SIG pin. So by reading the voltage at the SIG pin you can determine how much light the phototransistor is being exposed to. The board can easily be connected to a microcontroller and will operate at 3V or 5V. A phototransistor with easy to use connections. 1 x Ambient Light Sensing Breakout Board. Day / night activation of equipment.